Swiss products are more famous than Swiss people. Which is perfect since The Frau would like to offer you a very Swiss gift guide. See below for ideas to make your Christmas as Swiss as possible. Some are clichés. Some aren’t. You decide. Nothing says Switzerland quite like a big cheese grill. The Frau’s old Swiss neighbor is proof. When The Frau went to visit her in October, she made Raclette. Thirty slices for three people, to be exact. If you’re in Switzerland, you can find a great Raclette grill everywhere. But if you’re in the U.S., like The Frau, you can find them online. En Guete, mitenand. Did you know the Alps are a source of natural graphite? Well now you do. Caran d’Ache started as a pencil factory in 1915 and today it’s a Swiss writing instrument and manufacturing icon. The Frau and Little M love their colored pencils. ASANDRI is a Zurich-based Swiss fashion label that creates beautiful, high-quality clothing for professional women. What’s more? You can now find ASANDRI fashions in Baden, approximately 100 feet from where The Frau used to live. The store is called Villa Paul. Not in the fashion capital of Baden? Well, that’s ok. ASANDRI is also available in Zurich, Klosters, New York, Vienna, and, yes…Houston. Speaking of Swiss fashion, maybe you’ve heard of St. Gallen? It’s the capital of the Swiss textile industry. Jakob Schläpfer fabrics, anyone? Never heard of them? You must not be Chanel, Vivinenne Westwood, or Marc Jacobs, who all use silk from this famous St. Gallen-based company. Now that you’re educated, it’s time to get fashionable. A beautiful Swiss-inspired scarf design from this company is available here. 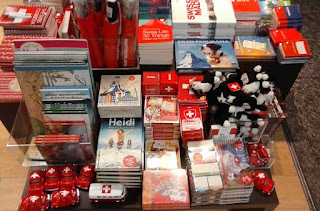 displayed near "Heidi Das Stickerbook" at Zurich Airport. The Frau brought back the Heidi Sticker Book for Little M in October and it was a big hit. There are over 100 stickers and two beautiful Alpine backdrops to arrange them on. Viel Spass, mitenand. A raclette grill would be a great thing for entertaining here. I think I will get one. Wow. That is some comment. Why is Switzerland so expensive?